Note: I love the Hayman’s team. After visiting their distillery and trying all their gin, they kindly sent me some samples. 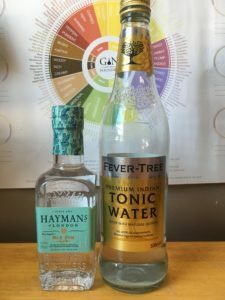 If you’ve been paying attention, you’ll have read my blog post about Hayman’s London Dry gin. Well, guess what? I have more gin! 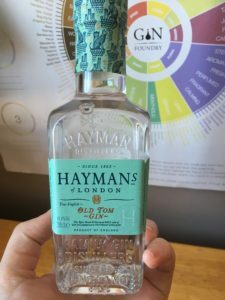 Today I am trying their Old Tom gin which, as a style, is one of my favourites. You may or may not know but a Tom Collins is one of my favourite drinks. The Hayman’s version of Old Tom gin is heavy on the citrus and juniper to create a rich mouthfeel, which then has an undercurrent of sweetness that lets you know you are drinking an Old Tom rather than London Dry. Opening my little bottle, it has the sweet, honey scent that is so identifiable with Old Tom gins backed up by the pine fresh juniper. In the glass it becomes fresher and more balanced but with a herby depth to it. Adding a splash of water and it is a tad spiced on the tongue, although this might just be as I’m drinking in the early afternoon, and again that thick honey feel is there at the back of the mouth. Mixed with some Fever Tree tonic and the sweetness is the most obvious thing, not cloying or sticky, but enough to balance the dryness of the tonic really well. The citric notes are there but lurking in the background to add a note of acidity to counteract the sweetness. Mixed into a Tom Collins (50ml gin, juice of half a lemon plus some sugar/sugar syrup in a glass and mix, add ice and mix, top with soda water and a lemon wedge) and it is incredibly drinkable. Perhaps because I free poured the soda instead of measuring it but the gin doesn’t stand out – although in a Tom Collins that’s not really the point. Super refreshing, a hit of sourness from the lemon juice and wedge, sweetness from the gin and sugar. Perfection. Yay to afternoon drinking. You can get yourself a 70cl bottle of 40% Old Tom gin from Gin Kiosk for £23.45 (at time of writing). I stick with my opinion from the last Hayman’s blog. Totally worth it. You get a craft gin at a mass-produced price point and the quality you get it far superior to the standard Gordon’s etc. You can find Hayman’s on Facebook, Twitter and Instagram.